Thirty years ago today Iron Maiden released their sixth studio album, the progressively tinged Somewhere In Time. Following up the incredible success of the preceeding Powerslave album and subsequent World Slavery Tour, Time came nearly two years after Powerslave‘s release and found some diehard fans disappointed with its more experimental leanings. The album was advanced a few weeks earlier by an amazing lead single, the Adrian Smith penned “Wasted Years“, a song which is still in the band’s live set on a regular basis. It was the first time that a song written entirely by Smith was released as a single, and it ended up being the only song on the full length album that didn’t have guitar synthesizers on it. The synthesizers, of course, were the biggest surprise on the record. It was only a few years previous, on 1983’s Piece of Mind, where the liner notes proudly noted that there were NO KEYBOARDS at all used in the recording of the album, so to hear those guitar synths so prominently in the album’s first cut, “Caught Somewhere In Time” was a quite controversial thing. I remember having long, drawn out arguments with my friends about the fact that Maiden was ‘selling out’ by using keyboards, and I have a number of friends that jumped off the Maiden fan wagon with this album’s new sounds. Looking back at this album thirty years later, Somewhere In Time stands the test of time as another great album by the band. Yes, it was a bit of an adjustment getting used to this somewhat new direction (although really, was it all that different because of a few synth parts here or there? ), but there are a number of songs on the album that go down as complete Maiden classics: “Wasted Years”, “Stranger In a Strange Land“, “The Loneliness of the Long Distance Runner” and “Heaven Can Wait” being my choices as the top cuts off the album. “Heaven” became the song that the band would invite guests and select audience members from the crowd onstage to help with the choir vocals. I was lucky enough to get invited up once to do this, although it was on the band’s tour for The X Factor and Bruce Dickinson was no longer in the band at that time. 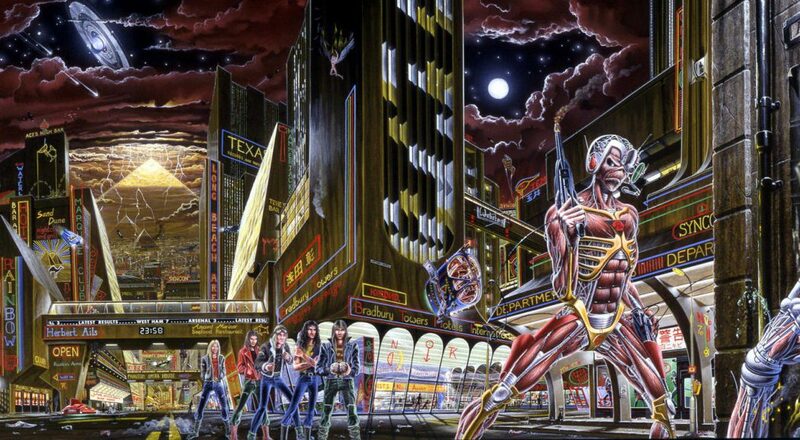 Somewhere in Time also boasts my favourite album cover out of all the classic Maiden covers. Derek Riggs really hit it out of the park this time out, with a Cyber Eddie somewhere in the future looking straight out of Blade Runner. The album has so many cool images linking back to their previous albums, it mentions the band’s beloved West Ham football team, it has the TARDIS from Doctor Who parked in it and hey, is that the black cat from the back of the Live After Death album just behind Eddie? I spent hours and hours gazing at the magnificent artwork of this album and still love listening to this album three decades later. Happy birthday Somewhere In Time. You were a confusing head scratcher the first few times around, but I love you like a comfy old shirt and wouldn’t change a thing about you now. Here’s a link to listen to the album in its entirety. Metal George Pacheco in conversation with Rotting Christ frontman Sakis Tolis about their first twenty years as Greece’s most well-known black metal band.